A resident of the Sarasota/Manatee area since 2004, Robin has a zest for life and a passion for serving. She became a licensed Realtor® in 1986, navigating the Delaware, Pennsylvania, and Maryland real estate markets as she and her husband, Bob, voyaged the Chesapeake Bay in their 43’ sailboat. Upon moving to Florida nearly fifteen years ago, Robin switched gears, relinquishing her licenses in favor of runnin... more.g for public office. She was elected twice as a Manatee County Commissioner, using the service-oriented skills she attributes to her real estate background to not only make a difference in people’s lives but to effect change in an entire community. Now having returned to the real estate scene, Robin is proud to be affiliated with Michael Saunders & Company where the brokerage’s market presence, professionalism, marketing, and technology are second-to-none. As a Realtor®, Robin is known for her tenacity, dedication, and compelling drive to exceed expectations. In her career prior to real estate, Robin worked for a subsidiary of Provident Bank in Delaware, running their Trust Department Money Market Funds. Her background managing other people’s money along with significant experience in the real estate market is an ideal combination for helping people decide on their best options for all their real estate needs. Robin has a Bachelor of Science from the University of Delaware in Home Economics with a minor in Psychology. 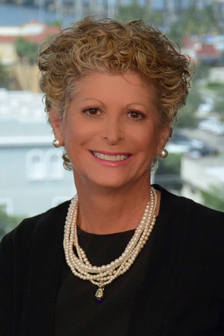 Robin has served on the boards of numerous professional and civic organizations and, in fact, has apartments named after her in Manatee County. As Commissioner, she helped spearhead an initiative with Harvey Vengroff to bring affordable housing to the region. After accomplishing their mission, Vengroff renamed the complex, “Robin’s Apartments”, complete with a sailboat in the logo. She remains passionate about the need for fostering more affordable housing. In her spare time, it may come as no surprise that Robin enjoys sailing and, together with her husband, has voyaged the eastern coast (from the Chesapeake Bay to Twin Dolphin Marina) in just ten days, as well as make regular trips to the Bahamas. Robin and Bob have a daughter, Meredith, son-in-law, Charles, identical step-grandsons, Charlie and Conner, and two grandpets, Chloe and Gracie. ...less.